Jerky is the quintessential snack of hunting season. Convenient to carry in the fields, woods, or marsh, it’s easy to appreciate the versatility and reliability of this flavorful snack. All jerky, however, is not created equal. While there’s quality jerky at high-end retailers, it’s oftentimes costly. On the other end of the spectrum is gas station jerky, which is full of preservatives and hard-to-pronounce ingredients. 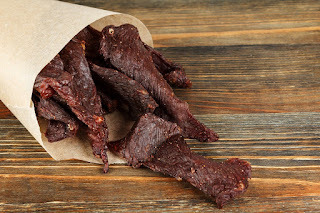 Historically, hunters have proven themselves to be scrappy, so it’s no surprise that their solution to this conundrum is to make jerky at home, which is cost effective, healthier, and not as intimidating as it may seem. To make delicious jerky at home, it’s important to be armed with the necessary supplies (which we will touch on throughout this post) and enough time to do it right. Give yourself at least a day of flexibility to tend to meat while it’s cooking or drying. If you’re new to making jerky, start with smaller batches and see which method best suits your kitchen habits and taste buds. Read on to learn how to make jerky at home, as well as useful tips for best results. There are so many decisions when approaching how to make jerky for the first time, but don’t let that put you off. Once you figure out your favorite methods, you can be as consistent or creative as you want. Newbies typically start with an oven, since it’s an appliance most already have in their home. But plenty have argued for the benefits of using smokers or dehydrators. Smokers tend to be the most intensive, requiring lots of attention and have a higher risk of over-drying. Dehydrators are best for those looking to make jerky consistently because they’re typically easy to clean, can be set to the same settings repeatedly, and allow you to walk away for longer periods of time. Aside from cooking methods, you also have to decide whether to grind or slice meat, whether to make strips or sticks from the ground meat, and how thick you should make strips and slices. As evident on the multiple forums and blog posts where hunters debate the best type of jerky and ways to prepare them, there’s no true superior method. At the end of the day, it comes down to your preferences. Chewy or brittle, stick or slice, classic or unique. This is where your decisions truly affect the outcome of jerky. Always stick to leaner cuts (i.e. flank steak, eye of round, sirloin tip, bottom round, and top round), which result in a more tender chew and offer a longer shelf life than fatty cuts. Fat dramatically increases expiration. It’s also wise to trim any excess fat from lean cuts. The thickness at which you slice the meat can either make it easier, or much more difficult, to chew. The optimal slice is ¼”. Consider using a cutting board preset specifically for jerky. Not only will precision be more attainable, but it also makes slicing a much safer activity. Before you even take to slicing, it’s recommended that you freeze the meat for 30 to 40 minutes beforehand for better control. Most blogs and recipes will suggest cutting with the grain for a traditional leathery chew. If you’re looking to crumble the jerky to use as a topping or for other recipes, however, cut against the grain for a more brittle and chewier end product. Slicing jerky isn’t the only option! Another popular choice is grinding meat and using a jerky gun, which gives you the ability to make sliced or stick jerky, as well as sausage. There are a ton of ways to address seasoning, and this may be where you can experiment the most. When starting out, your best bet is to opt for simple salt and pepper. When the texture and flavor of the end result isn’t competing with strong flavors, you’re more likely to get a better sense of what you like about it, and what you’d want to try next time. Once you know exactly how you like to make jerky, that’s when the real experimenting can begin. Check out blogs and forums to find DIY seasoning recipes, or seek out reputable seasoning products available online or at a local retailer. Regardless of the seasoning you try, be sure to marinade the meat for 4 to 24 hours before cooking/dehydrating. The longer the meat marinades, the more flavorful it will be. For best results, let meat soak overnight. Pat jerky strips dry to help speed up the dehydration process. As mentioned previously, the three methods of making jerky are baking, dehydrating, and smoking. With baking and dehydrating being lower maintenance, using a smoker requires more attention. Every aspect of the smoker will influence the final result, especially the type of wood chips used. Some view this as an opportunity for more experimentation, while others see it as a potential for inconsistent and unreliable results. Dehydrators, on the other hand, allow for a higher quantity of jerky, as well as more control of every aspect of the dehydrating process. As always, use your discretion to decide which option best suits you. The beauty of jerky is its convenience and long shelf life. When stored in the fridge, it can maintain all its flavorful goodness and chewy texture for up to six months. Or enjoy jerky within seven to ten days when kept in a cool, dry place. Vacuum sealing bags of jerky will ensure the snack will last one to two months when stored in room temperature. After cooking/dehydrating the meat, let cool for several hours before storing. Never freeze jerky, as it can alter the taste. If you notice condensation inside a bag or container of jerky, it’s time to throw it away. 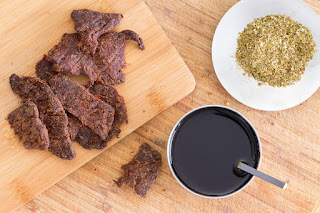 What’s your favorite way to make jerky at home? Feel free to share tips and recipes in the comments section below! Wow!looking so yummy.very informative post.love the blog.thanks for sharing it. I believe that jerky is a very tasty snack but I don't eat meat these days. 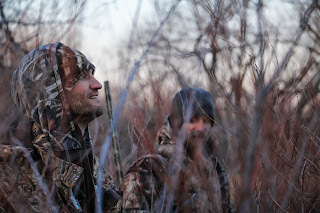 I remember hunting seasons in my childhood when my father was cooking jerky at home. It was so delicious and tasty and at the rating of Rephraser this meal is on top for the season. Thank you for refreshing my memories.